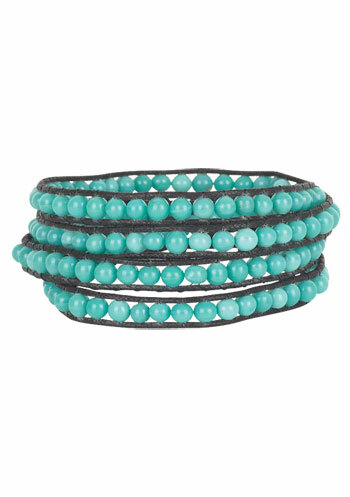 Chan Luu's turquoise beaded bracelet retails for $102 at Bluefly, a designer discount site. The color of the cord is different on this version from Alloy (which also comes in several other color options), but otherwise it's a great option if you're trying to save some cash. It retails for $14.90 each, but they also have a promo going on - 2 for $12.90 each, 3 or more they're only $10.90 each. Click here if you're interested in purchasing. I like it! Turquoise is very popular right now! For some more beautiful turquoise jewelry check out www.silverstateturquoise.com! Thanks!